The LG Nitro HD is one of the first handful of Android smartphones able to use AT&T's Long Term Evolution 4G network and packs a gorgeous high-def display. Here is Phone Scoop's full review. Phone Scoop was able to spend some time with the LG Nitro HD. This new Android phone from LG brings an HD display and LTE to the table. Consumer Cellular today announced the addition of two Android smartphones to its roster of devices, the LG 930 and the Samsung Galaxy Exhilarate. The LG 930 (sold by AT&T as the Nitro HD), features a 4.5-inch HD display, 1.5GHz dual-core processor, 8-megapixel camera with HD video capture, front camera, DLNA wireless media streaming, and a memory card slot. AT&T today announced that it will push Android 4.0 Ice Cream Sandwich to the LG Nitro HD starting Tuesday, July 31. 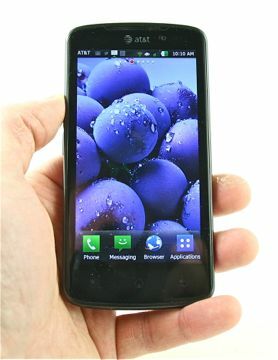 The update will also include LG's new Optimus 3.0 UI. AT&T today published a list of devices that it plans to update to Android 4.0 Ice Cream Sandwich in the coming months. The devices include the LG Nitro; the Motorola Atrix and Atrix 4G; the Pantech Burst and Element; and the Samsung Captivate Glide, Galaxy Note, Galaxy S II, Galaxy S II Skyrocket, and Galaxy Tab 8.9. This phone should be Lag-Free ! I have a 600 mhz Samsung Galaxy 550 (GT-I5500) that, judging from the videos, has less lag than that 1.5 Ghz Dual core beast. LG Nitro from a cell pro. I have been selling AT&T for 3+ years now. My experience with this phone is mediocre at best. The above review is fairly accurate but I will add in my perspective as I am in Indianapolis where LTE service is fully active. 1. The LAG!!!! It is awful. Transitions between pages lag and make you want to spam buttons as if you didn't hit it at all. Lag loading web pages as well and the pinch to zoom is flakey. 1.5 dual core is a joke. They have the tri-dual configuration for RAM/CPU processing but I was told they didn't add it to keep the phone sleek. Id rather have a larger phone which will transition seemlessly. How do you determine the voice quality being an issue of the device and not the network? --would like to see more video, though. Edit: lol--there's some Nitro HD video on your Youtube channel.